The same as for shakes, vegans should not worry about ingredients when making a pudding! Here is a very simple way to make a healthy appetizer the Japanese way! -Mix the agar agar in a little water. -In a pan drop the tofu and agar agar. Heat over a medium fire and stir into smooth paste. As soon as the agar agar has dissolved into the tofu. Switch off fire and take away the pan from the fire. -Drop the tofu inside a food processor. Add the avocado cut into rough pieces and seasoning, and process until smooth. -Pour the mixture inside lightly oiled molds. Let cool completely and leave inside refrigerator to chill and harden. Great with wasabi dressing, or ponzu! 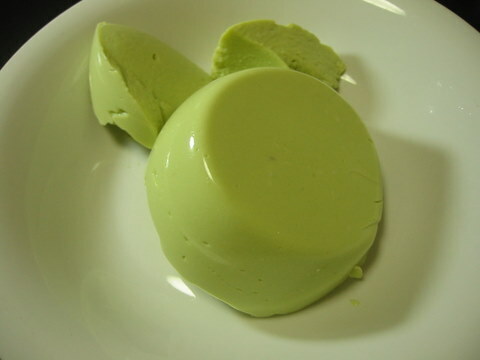 If you like your pudding solid, pour it into a rectangular mold and cut it in slices like sashimi! I may think a different way since I used to have avocado as sweet shake. I might twist this recipe into sweet dessert. Thanks for the idea! I’m sure you will improve on the recipe! I like this and I am not even vegan.